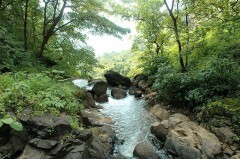 Travel away from the noise of the urban crowds and spend your day off at a scenic forest lodge in Durshet, near Mumbai. 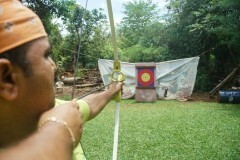 Here, you can participate in exciting and fun activities like net climbing, archery, Tarzan Swing, ziplining and Burma Bridge. 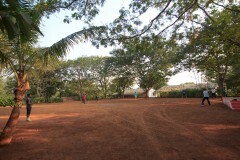 With views of tall trees and open spaces all around you, you can relax in the common areas, take a dip in the swimming pool or enjoy a game of cricket or football with your group. In the evening, you can gather around a merry bonfire to celebrate a day spent outdoors. This overnight adventure trip in Durshet is a great option for groups of friends or family looking for a quick, outdoor getaway from Mumbai or Pune. This package includes overnight stay in AC rooms. 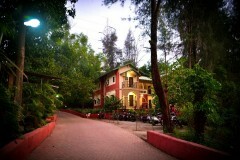 This pretty forest lodge in Durshet is easily accessible from Mumbai with a short 2-hr drive. 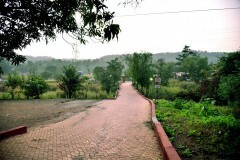 The lodge, set against the vast forests of the Sahyadri range, is located close to a small monsoon-fed river stream that rejuvenates the greenery of the lodge. The well-maintained lodge is decorated with sprawling tree plantations of teak and oak, with small birds chirping from treetops. The scenic delights of this nature-rich retreat makes it a great option for corporate overnight trips and groups of friends and family. 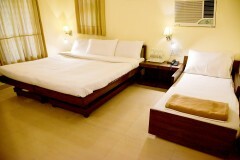 For this overnight adventure trip, you'll stay in AC rooms with attached washrooms, private balcony and comfortable bed. 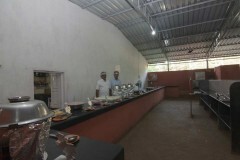 Delicious buffet meals will be served at the common dining area. 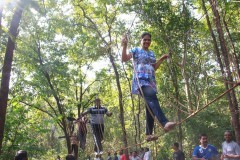 This Durshet adventure trip is a non-strenuous activity. However, if you have any pre-existing medical condition such as cardiac disorders, bone or spine ailments and respiratory problems, please consult your personal physician before booking this trip. For cancellations made more than 72 hours before check-in date of the Durshet adventure trip: 90% refund. 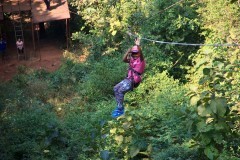 For cancellations made 48-72 hours before check-in date of the Durshet adventure trip: 75% refund. 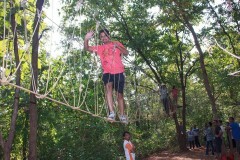 For cancellations made 24-48 hours before check-in date of the Durshet adventure trip: 50% refund. For cancellations made less than 24 hours before check-in date of the Durshet adventure trip: no refund. Check-in time at the forest lodge is 17:00 hrs, while check-out time at the forest lodge is 15:00 hrs. Bookings for children younger than 5 years are not charged. 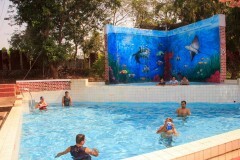 Bookings for children aged 5-12 years are charged at a discounted price of INR 1,350 per person. Bookings for children older than 12 years are charged at full price. 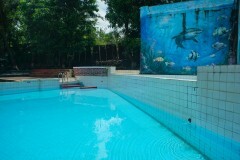 Prices displayed are only applicable for weekend and public holiday bookings. Weekday bookings are charged with an off-season discount. There is no pick-up for this Durshet adventure trip. There is no drop-off for this Durshet adventure trip. 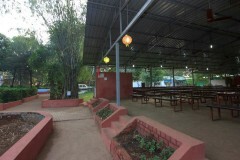 Day 1 of the Durshet adventure trip: Check-in and enjoy! Arrive at the forest lodge by 17:00 hrs. Here, you'll register at the reception area and check-in to your AC rooms. 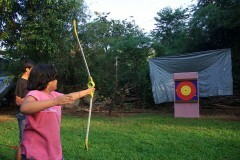 Have evening snacks at the common dining area, and spend the rest of the day participating in fun activities like net climbing and archery. 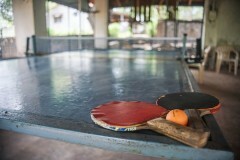 Explore the forest lodge, take a dip in the swimming pool, play cricket or football with your group in the common ground and visit the banks of the Amba river. You can end the day with some delicious dinner and a merry night around the crackling bonfire. Overnight in AC rooms at the forest lodge. 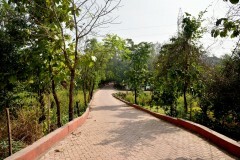 Views of lush greenery surrounding the forest lodge. Wake up to some bed tea delivered to your rooms. After breakfast at the dining area, you can spend the rest of the day participating in fun activities like Tarzan Swing, Burma Bridge and ziplining. You'll check-out of the forest lodge, post lunch by 15:00 hrs. Your trip ends here. Overnight in AC rooms at the forest lodge. Check-in to the forest lodge by 17:00 hrs. Today's meal package includes evening snacks and dinner. 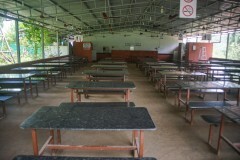 All meals are served buffet-style at the common dining area. 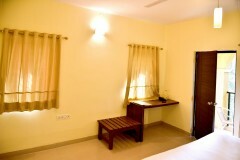 You'll be accommodated in AC rooms with a double bed and an extra bed for the third traveller, an attached washroom and air-conditioner. 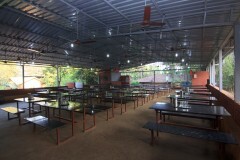 Inside view of the AC rooms. Your trip ends by 15:00 hrs. Today's meal package includes breakfast and lunch only. A non-vegetarian option will available for lunch and dinner. 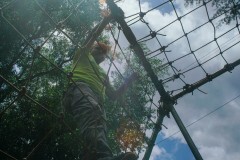 Check-out of the forest lodge by 15:00 hrs.